Here’s a seldom seen, colorful marine mammal few people have ever heard of – the Ribbon Seal. An Arctic species, one has been vacationing inPuget Sound near Seattle for the last few weeks. The ribbon seal (Histriophoca fasciata) is a medium-sized pinniped from the true seal family (Phocidae). They are among the most striking and easily recognizable. They can be identified by the distinctive light-colored bands or “ribbons” that encircle their neck, each foreflipper, and hips. The contrast is particularly strong with the males,having a dark brown to black pelage with white ribbons, females range from silvery-grey to dark brown with paler ribbons. Newborn ribbon seal pups have white natal fur. After moulting their natal fur, their color changes to blue-grey on their backs and silvery beneath; after some years some portions become darker and others brighter, and only at the age of four years does the typical design show. Ribbon seals molt their coat of hair annually, beginning in May and finishing in July, with younger individuals molting earliest. The ribbon seal has a large inflatable air sac that is connected to the trachea and extends on the right side over the ribs. It may function as a buoyancy device, for air storage during diving, or for “phonation.” It is larger in males than in females. The ribbon seal can grow to about 5.2 ft long and weigh up to209 lb in both sexes. Ribbon seals alternate their foreflippers and swing their hindquarters to run across ice, rather than using the caterpillar-like movement typically used by most seals. Ribbon seals are also physiologically and anatomically adapted to make deeper dives (up to about 1950 ft (600 m)) and swim faster than other seals. They have an air sac that Ribbon seals are a seasonally ice-bound species found in the Arctic and Subarctic regions of the North Pacific Ocean, notably in the Bering Sea and Sea of Okhotsk, and adjacent parts of the Arctic Ocean, including the Chukchi Sea, eastern Siberian Sea, and western Beaufort Sea. These seals are relatively solitary, spending most of their time in the open ocean and forming loose aggregations in the pack ice during spring to give birth, nurse pups, and molt. They are very rarely seen on shorefast ice or land. This species seems to prefer moderately thick, “clean” ice floes found in the inner zone of the ice front. From late-March to early-May, ribbon seals in the Bering Sea range from the Pribilof Islands to Gulf of Anadyr, roughly along the continental shelf break, being more abundant in the northwestern ice front. As the ice recedes during May to mid-July, the seals move farther to the north where they haul out on the receding ice edge and remnant ice, occasionally in dense groups. After the ice has melted, most ribbon seals probably either migrate with the receding sea ice through the Bering Straight into the Chukchi Sea or remain pelagic in the Bering Sea during the rest of the year. Thus far, there have been only two acknowledged instances where ribbon seals have been found as far south as Seattle, Washington and even further south at Morro Bay, California. There was nothing to suggest that illness was the cause of either seals appearance at either place, as both appeared to be healthy.Ribbon seal mothers give birth to their pups far offshore in the pack ice during April to early-May. The pups double their weight during nursing and are weaned after three to four weeks. Mating likely occurs shortly after weaning, though little is known of the breeding system. Ribbon seals are known to eat a variety of fishes, cephalopods, and crustaceans; however, information about their feeding habits is limited and mostly restricted to the spring when ribbon seals are typically feeding less, as evidenced by their decreased weight and blubber thickness. Although there is little direct evidence of predation, potential predators of ribbon seals include polar bears, killer whales, sharks, and walruses. Ribbon seals are relatively unwary while hauled out and can be approached closely by boat. This behavior suggests that ribbon seals probably do not experience much predation by polar bears, but may also make them especially susceptible to hunting by man. Siberia and Alaska Natives have hunted the ribbon seal for many generations for subsistence, and the current annual take by Alaska Natives is estimated to be less than 200 seals per year. Commercial harvests of ribbon seals were conducted by Soviet sealers in the 1960s to 1980s, during which time the Bering Sea population is thought to have declined from 80,000 or 90,000 animals to 60,000. Surveys during the early and mid-1970s put the worldwide population estimate of ribbon seals between 200,000 and 240,000, with estimates ranging between 60,000 and 100,000 in the Bering Sea. A more recent and reliable abundance estimate is not currently available. Predators of the ribbon seal include orca, the Greenland shark and polar bears. In the 1960s, the population of ribbon seals in the Bering Sea was reduced from about 120,000 to 70,000. The population size increased back to about 130,000 in 1987 after quotas were set to limit harvest to about a fourth of the number of seals hunted previously. In the latest stock assessment (2007), the National Marine Fisheries Service estimated a global population size of 240,000 ribbon seals, 90,000-100,000 of which inhabit the Bering Sea. In the Okhotsk Sea, the average number of ribbon seals was 370,000 between 1968 and 1988. The current population trend is unknown, but recent estimates suggest that no catastrophic declines have occurred in recent decades. Humans have hunted ribbon seals for generations and are still hunted today by Siberia and Alaska natives for subsistence, but the number of seals harvestedhas always been relatively small (less than 100 in Alaska). In the early 1950s, the USSR began commercially harvesting ribbon seals in the Sea of Okhotsk ; the fishery quickly intensified in the 1960s,with an average of about 13,000 to 20,000 seals harvested per year. Ribbon seals were also hunted in the Bering Sea beginning in 1961, with an annual harvest of nearly 10,000 individuals. As the ribbon seal population declined, annual harvest also fell, dropping to 3,500 in the Sea of Okhotsk and 3,000 in the Bering Sea in the 1980s (Popov, 1982). Harvest continued to fluctuate in relation to ribbon seals abundance and political and economic unrest. Although the Russian governmentquotas recently put in place would allow large annual harvests (18,000), the annual harvest remains relatively low today. Other human impacts to ribbon seals include growing oil and gas development in the Okhotsk and Bering Seas, oil spills, and incidental take in commercial fisheries. 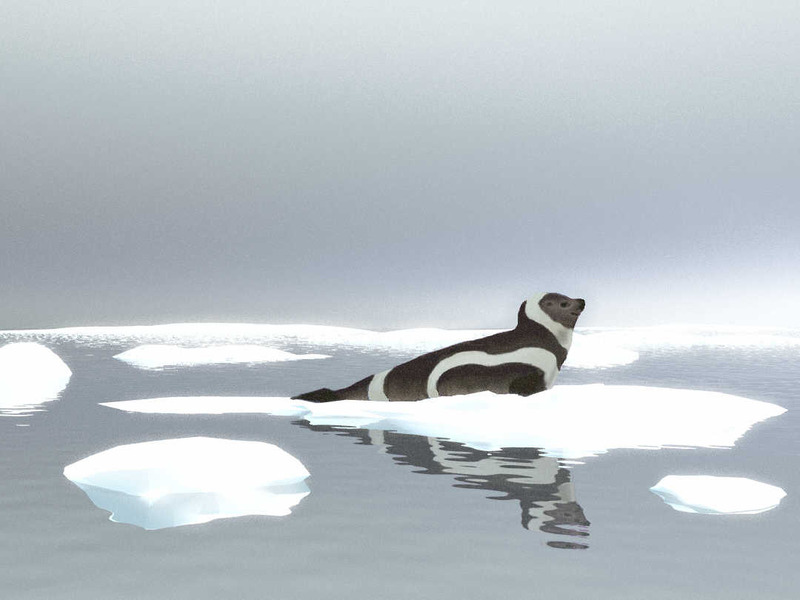 In addition, global warming may affect the frequency of years with extensive ice, the quality of the ice, and the duration its persistence such that the amount of available sea ice habitat for ribbon seals within their historic range is reduced.